400g rhubard. 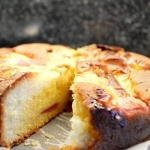 250g pack of butter, 150g tin of ambrosia custard, 250g self raising flour, 1/2 tsp baking powder, 4 large eggs, 1tsp vanilla extract, 250g caster sugar, icing sugar for dusting. 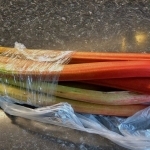 Heat oven to 200 c, rinse the rhubarb and cut into finger length pieces. Put on a baking tray and tip over 50g of caster sugar and toss together, smooth out on tray, cover with foil and roast for 15 minutes, remove foil, shake and roast for a further 5 minutes. Reduce oven to 180c. Butter and line a 23cm loose bottom cake tin. Reserve 3tbsp of custard in a bowl. Beat the rest of the custard with the butter, flour baking powder, eggs, vanilla and sugar and cream until smooth. Spoon 1/3 of the mix into the bottom of the tin and smooth out. Arrange 1/3 of the rhubarb on this mix then cover with another 1/3 of the mix and repeat with the rhubarb. repeat with the final third of the mix and scatter the remaining rhubarb on top and dot with the custard. Bake for 40 minutes until risen and golden then cover with foil and bake for a further 15 to 20 minutes. check its cooked through with a skewer. cool on a tray and scatter with icing sugar when cool.